A daring world record attempt to fly by microlight from England to Australia has hit delays in Ramree Island due to heavy storms and low cloud cover. 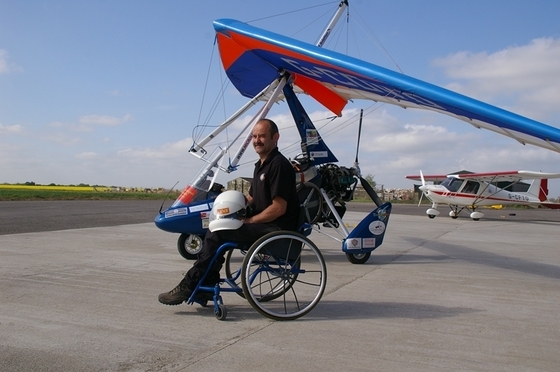 Dave Sykes from Yorkshire, England is aiming to be the first paraplegic to fly a microlight aircraft 11,600 nautical miles through 18 countries to raise money for the Yorkshire Air Ambulance service. Dave arrived in Kyaukpyu, Ramree Island, on Wednesday last week and has so far only got as far as Thandwe, about 100km south of Kyaukpyu. The seasonal monsoon weather has stifled his attempts to reach Thailand and he is having trouble clearing the Arakan Mountain Range. Mike Poole, a fellow member of Dave’s flying club, said: “He has to cross some high mountains to reach Yangon but despite several attempts has not yet been able to make it. On April 28 Dave started on his record-breaking journey from his flying club at Rufforth Airfield, England. His trip is intended to celebrate the 80th anniversary of Amy Johnson’s achievement of being the first woman to fly solo to Australia in 1930. More information about this inspirational flight and realtime tracking on Dave’s progress can be found on his website; www.soloflightglobal.com.